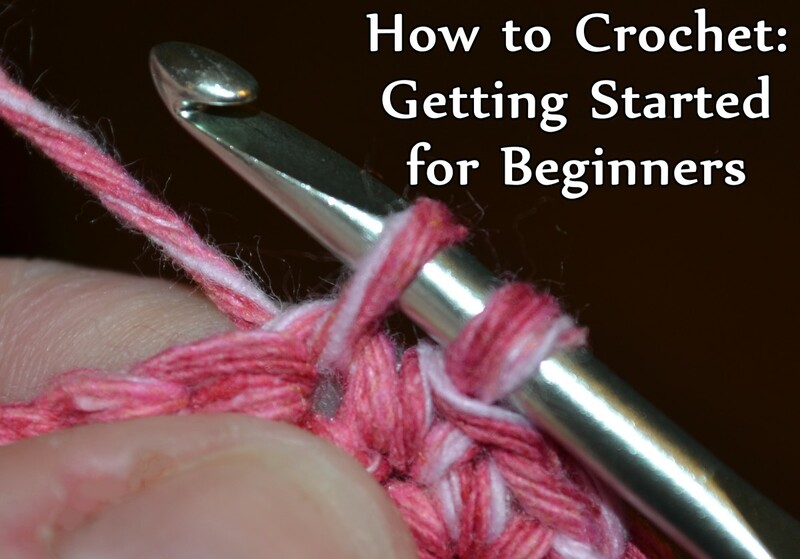 Whenever you are making a crochet project, it is quite easy to spruce up any simple design by adding ruffles. 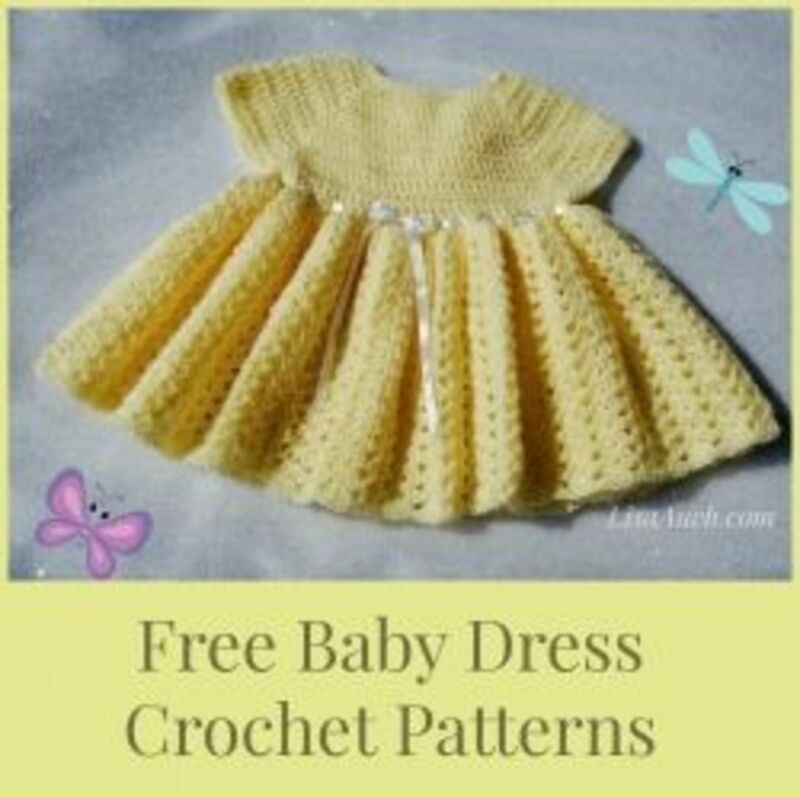 For this article, we will be sprucing up crocheted clothes with ruffles. Ruffles transform a simple outfit into something entirely new. 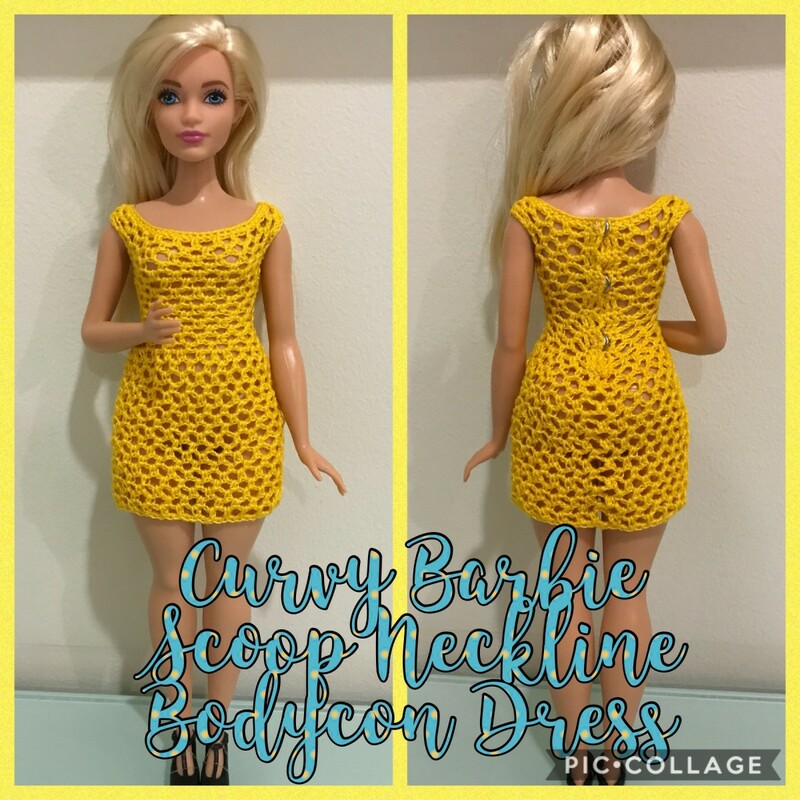 This article is all about ruffles—how to add ruffles to crochet patterns, some pictures of Barbie clothes with ruffles, and a simple pattern for adding ruffles to my simple bodycon design to make it into a peplum dress. The process is quite simple. Whenever you want to add ruffles to a design, just leave front loops of the right side of the work empty so you can add on to it later. If you will look at the pictures I have posted below, some designs have more than one layer of ruffles. 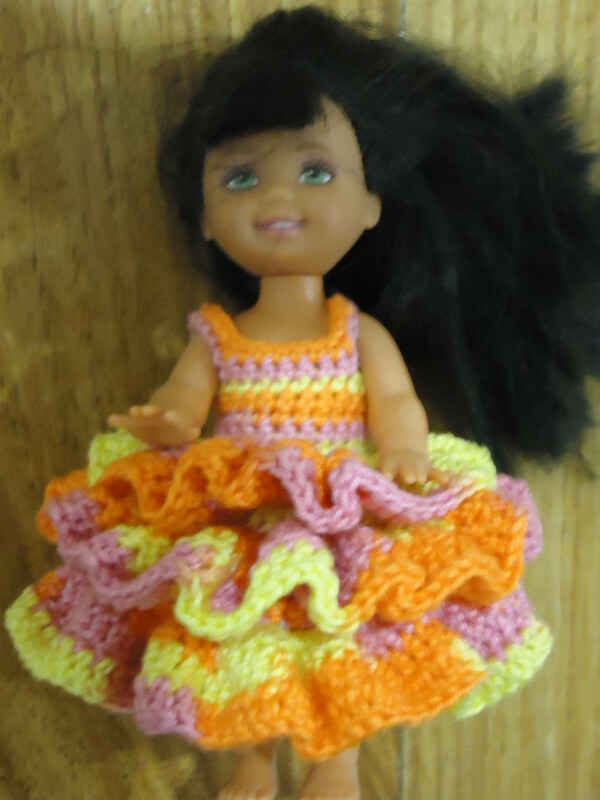 In order for this look to be achieved, front loops of several rows were left empty so the ruffles can be worked in. Basic Ruffle - With the right side of the work facing you, work 3 dc onto each stitch across the row you want to add the ruffle to. Working 3 dc per stitch gives you the ruffle effect you want. 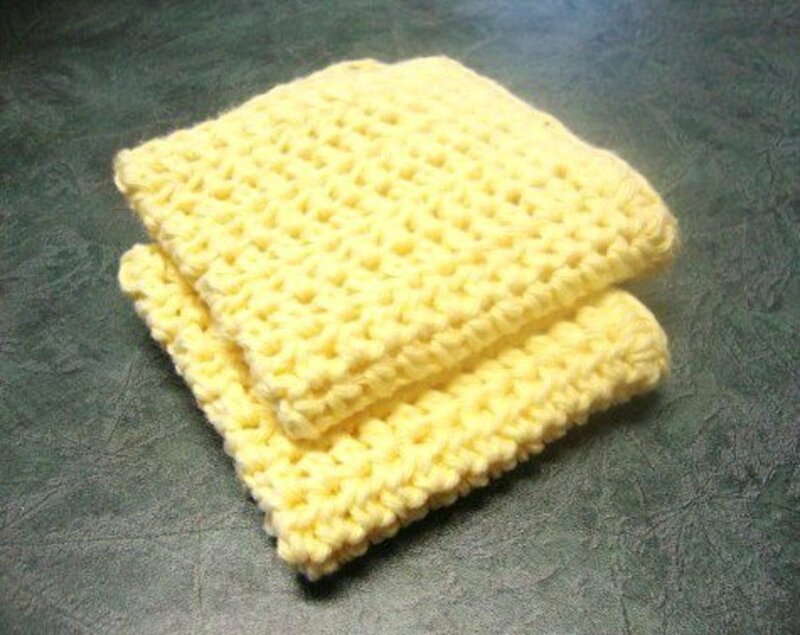 Deep Ruffle - If you find the basic ruffle to be too short in terms of height, you can continue adding a row of dc on top of the Basic Ruffle, and then adding 2 dc per stitch for the next row. A peplum is defined as a short, flared ruffle attached at the waistline of tops, skirts, or dresses. This has been a huge trend for the past few seasons. In this pattern, I will be making a monochromatic peplum dress for Barbie. It is a mini-dress with a simple ruffle design attached at the waistline. 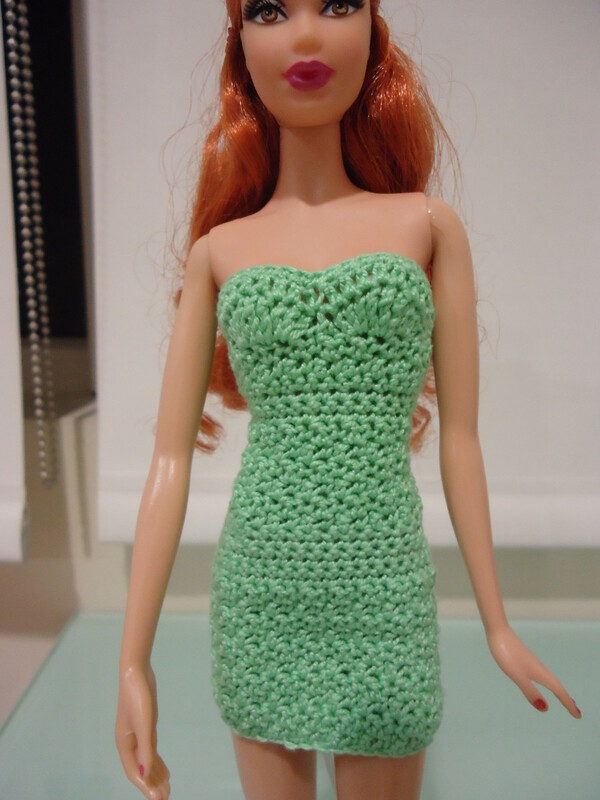 This dress is specifically made for Barbie Basics (or Model Muse). 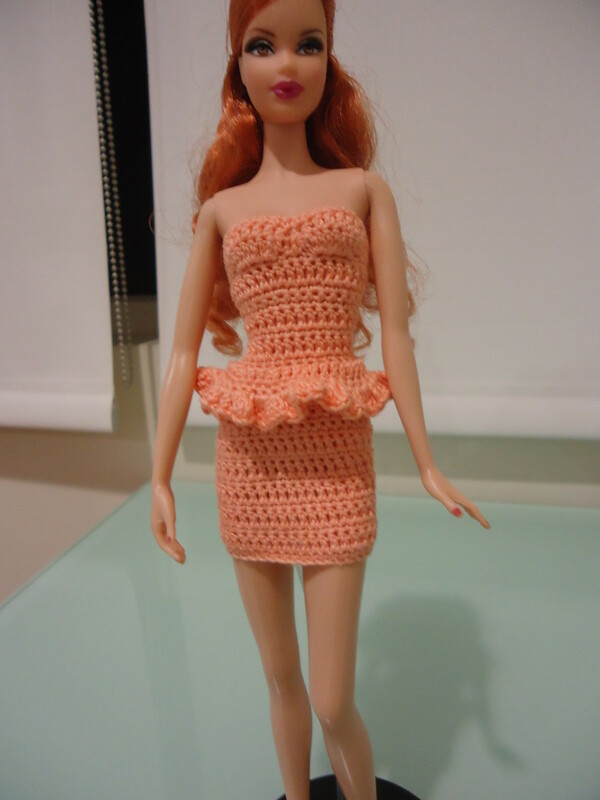 For more information on different body types, visit my article: Crocheting for Barbie Dolls. If you want the ruffles to have the same size as the base design, use the same size hook. 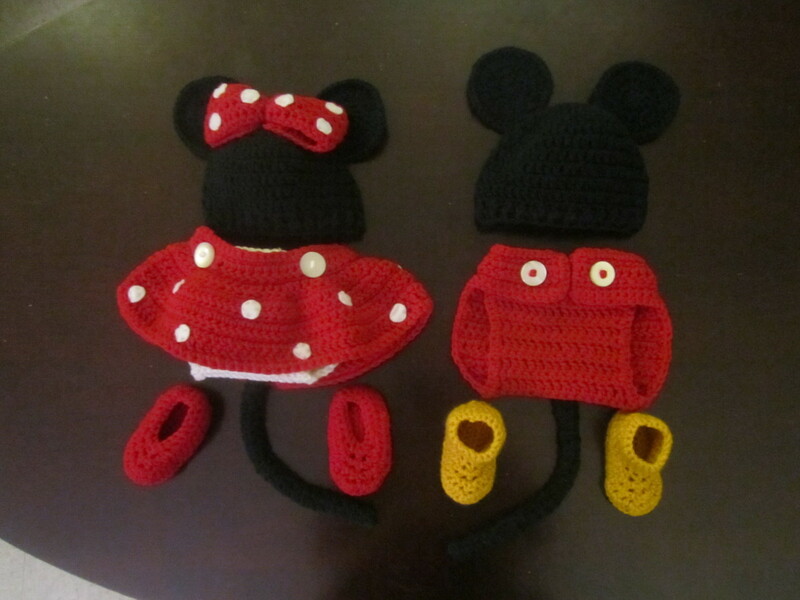 (For this design, it is done with the same hook to achieve a uniform look). If you want the ruffles to look even more detailed, you can use a smaller sized hook. If you intend to do very deep ruffles, I suggest you go for the small hook to have a greater ruffle effect. Choose a base for your dress, either the Simple Mint Green Bodycon Dress or the one in the picture, Peach Bodycon Dress. Work the pattern until you reach Row 19 or 20, and work that row with the front loops of the right side free for the ruffles. Turn the dress upside down. Row 1: Working on the free front loops of Row 19, sk 4 sts (to accommodate for the overlap at the back), join thread with sl st on the next st, ch 3 (counts as a dc), dc in the same st, *dc in the next 2 sts, 2 dc in the next st, repeat from * across, turn. Row 3: Ch 3, 2 dc in the first sc, *3 tr in the next sc, 3 dc in the next sc, repeat from * across, ending with 3 tr in the last sc. Experiment with the ruffles until you find it to your liking. 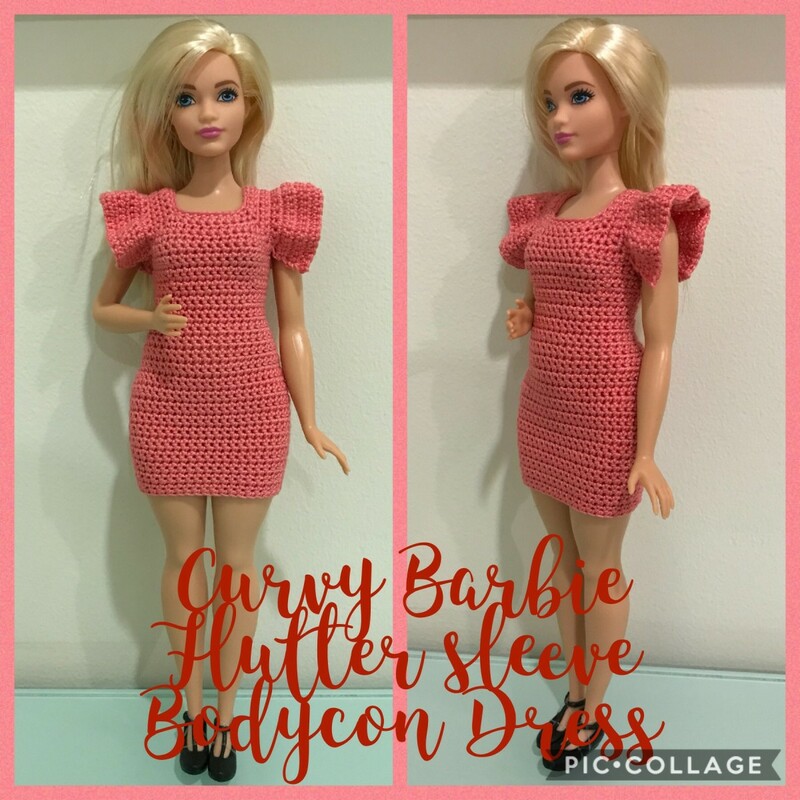 You can add another row of dc across the last row to extend the ruffles, or even add some length to the base of the dress for a more conservative look. Thanks for sharing! I would have included the book with the pattern for the one with the handbag in the Amazon capsule, but it doesn't let me link it. 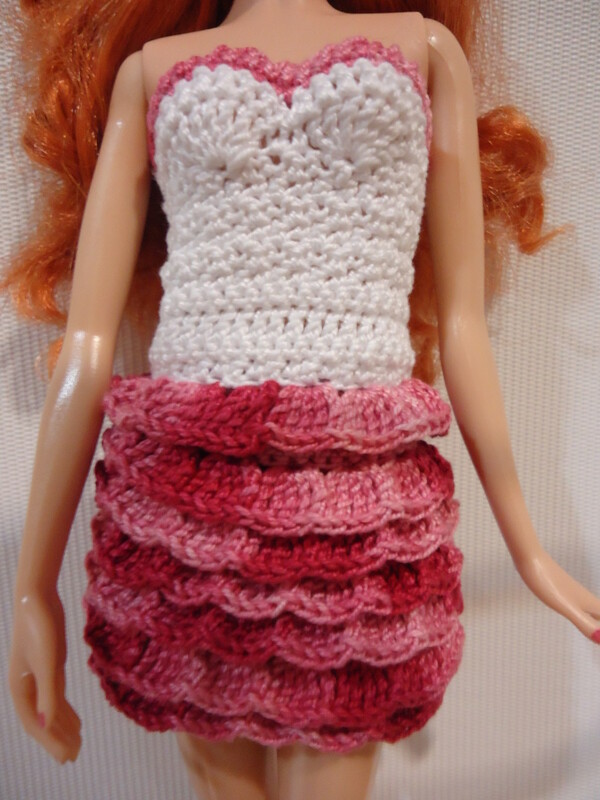 Wow these barbie clothes you have crocheted are so good. The dresses are great. I love the handbag in the photo too. It looks so professional. 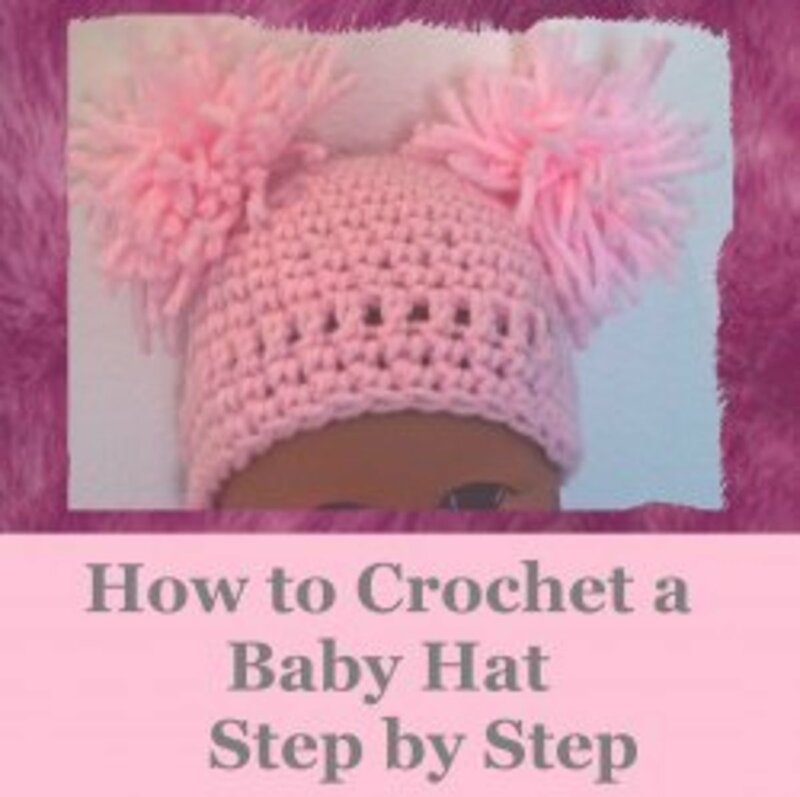 Will be passing this article on to my sister who loves to crochet barbie doll clothes.